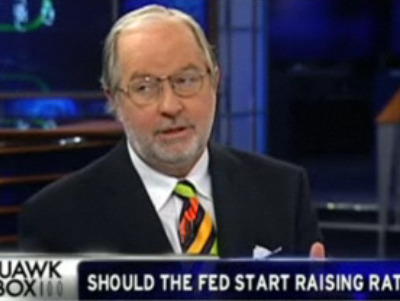 In his daily note, Dennis Gartman ponders yesterday’s “surprise” Chinese rate hike, noting that it was a surprise only due to timing, which he says is brilliant. We, like everyone else, were obviously very surprised by the timing of the rate increase, for although the increase itself was well telegraphed and was hardly a shock, the fact that the Chinese did it while technically still on holiday, celebrating the Lunar New Year, caught us wholly offside. In retrospect, this was and this is a brilliant move by the Chinese monetary authorities, for henceforth they’ve raised the element of surprise for all market participants. No matter what happens from this point forward we shall all say amongst ourselves, “Say, do you remember when the BOC raised the o/n lending rate by 25 bps while still on holiday?” It shall be a badge of honour in years hence to say, “I was there; I remember that,” rather like we hold it as a badge of honour to say that we remember when Paul Volcker changed the Fed’s focus from the o/n fed funds rate to targeting the monetary aggregates on “Black Friday” back in the late 70’s, or rather like being able to say “I remember when fed funds regularly traded 21%,” or being able to say, “Geez, I remember when Penn Square Bank failed and the TED spread went out a couple of hundred bps in one day.” Now we can all collectively remember when the BOC tightened policy while on holiday.